Time, money and enthusiasm are the essential ingredients of any historic building restoration, so, in times of recession, it’s only natural that even those with ample reserves of all three will think twice before embarking on a long-term project. ‘People need to know that they can get their money back, and, in the current uncertain market, buyers of historic houses, especially international buyers, are more likely to pay a premium for a well-restored property in the right area, rather than a lot less, initially, for one in need of repair,’ says Crispin Holborow of Savills’ country-house department. With exquisite timing, several important country houses have come to the market in recent weeks, having undergone years of complex, painstaking restoration. One is Grade II*-listed Denchworth Manor (pictured) in the village of Denchworth, near Wantage, Oxfordshire, for sale with its adjoining 234-acre estate through Savills (020-7499 8644) at a guide price of £6.5 million for the whole, or in four lots. Having bought the estate in 2005, the owners with guidance from English Heritage have meticulously restored the picturesque 15th-century manor house with its rendered medieval façade and decorative shell plasterwork, sensitively integrating its later additions. Now refurbished throughout to 21st-century standards of high-tech efficiency and comfort, the house has four main reception rooms, a study, a wine room, a large kitchen/breakfast room, a playroom, 10 bedrooms, six bathrooms and three dressing rooms. Other estate buildings include a Grade II-listed garden house, three cottages, former barns converted to 3,132sq ft of office space, stabling and various farm buildings. The oldest part of historic Grade II*-listed Bentley Hall at Hungry Bentley, near Ashbourne, south Derbyshire currently for sale though Caudwell & Co (01629 810018) at a guide price of £2.75m is thought to have been built in 1612-14 by Thomas Browne of Shredicote, Stafford-shire, who was granted the estate by James I in return for a ‘consideration’ of £2,600. The William-and-Mary west wing, added between 1690 and 1705, has all the hallmarks of the sculptor and architect Sir William Wilson, who was working at nearby Sudbury Hall at that time. The house was ‘improved’ in 1846, before being sold to Lord Vernon in 1860, and passing, 18 years later, with 1,040 acres, to S. W. Clownes of Norbury Hall. International media high-flyer Dan O’Donoghue and his wife, Suzanna, took a bit of a gamble when, in early 2000, they decided to buy Grade II*-listed, Tudor Hautbois Hall on the banks of the Bure at Little Haut-bois, 10 miles north of Norwich. Not only was the mid-16st-century manor house in a seriously run-down state, but it was also blighted by its proximity to RAF Coltishall, which has since been decommissioned. Approached along an avenue of quince trees flanked by 36½ acres of gardens, paddocks and traditional Norfolk grazing meadows, Hautbois Hall (pronounced hobbis) is an architectural delight, with its mellow red-brick walls, stone mullioned windows, pantiled roofs and towering chimney stacks. Reputedly built by William Baspole in about 1555 on the site of an earlier manor house, the hall has been beautifully renovated by the O’Donoghues, who have taken immense pains to preserve the integrity of its historic fabric, retaining the original Tudor fireplaces and exposed timbers and adding French oak floors to the principal rooms. The house is generally one room deep, the majority lit by double aspect mullioned windows, with the two main reception rooms sited either side of the entrance hall. The kitchen/breakfast room has handmade cupboards decorated to a 17th-century Florentine design by the artist Lizzie Riches. An antique oak staircase leads to the first floor, which has three good-sized bedrooms and a bathroom, with two further bedrooms and a family bathroom on the second floor. The various outbuildings have also been extensively renovated. 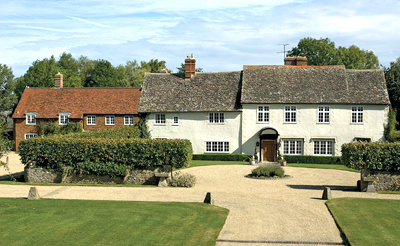 Bedfords (01328 730500) quote a guide price of £1.85m.